UGEARS intermediate model kits make building a fun and engaging hands-on experience. These kits are geared towards older kids and adults looking for a more complex project. Each model is pieced together from flat, unfinished, laser-cut plywood parts that don’t need tools or glue to be assembled. The finished product has parts that move, too, to put these models in motion. Dimensions: Flat kit: 14.6" x 5.7" x 1.2"; Assembled Motorcycle: 10.1" x 3.3" x 4.1"; Assembled Car: 13.8" x 3.7" x 5.1"; Assembled Locomotive: 12" x 3.9" x 4.9"
Weight: Motorcycle: 1.04 lbs. ; Car: 2.4 lbs. ; Locomotive: 2.93 lbs. The item I chose for my son was perfect. I would recommend it tp anyone who likes putting things together. This has not been built yet, but he was impressed by the detail of the gears, etc. He is excited to get started. 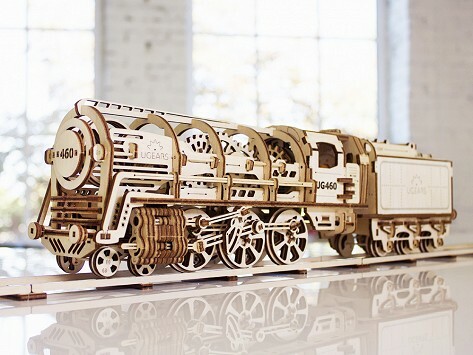 Great model train engine with thought! This was a gift for my brother. He really liked the challenge with the finished product. Wii get additional UGEARS products for family.